Margaret Mitchell was the District 2 Governor from 2008-2010. 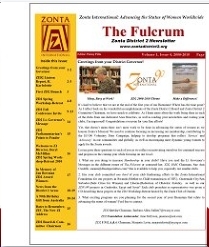 During that time she and her board produced the Zonta “Fulcrum” as the District 2 Newsletter. Several important events, conferences and projects were completed in this biennium. Note: To see copies of these click one of the images. Greetings from the ZD2 Governor! 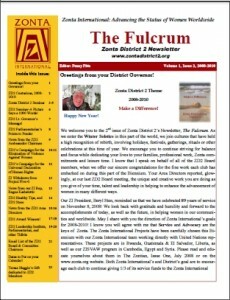 ; ZD2 Goals for 2008-2010, ZD2 Board and Committee Chairmen, ZD2 Leadership Institute, Welcome to the ZI Liaison, ZI Treasurer/Secretary’s Message, ZI Fundraising Goals, ZI Bylaws and Resolutions Changes. 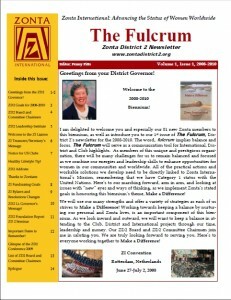 ZD2 Lt. Governor’s Message!, ZD2 Foundation Report, ZD 2 Seminar, Important Dates to Remember!, Glimpse of the ZD2 Conference 2009, List of ZD2 Board and Committee Chairmen, Epilogue. Greetings from your Governor!, ZD2 Centurions, 2008-2010, Zonta District 2 Seminar; ZD2 Seminar-A Picture says a 1000 Words!, ZD2 Lt. Governor’s Message! 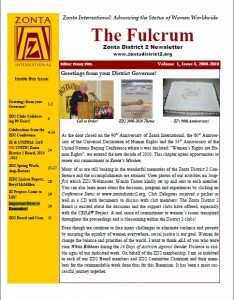 ZD2 Parliamentarian’s Points to Ponder, News from the ZD2 Ambassador Chairman, ZD2’s Campaign for the Elimination of Violence Against Women, ZD2’s Campaign for the Universal Declaration of Human Rights, ZI Withdraws from Project Five-0, News from our ZI Rep, Ragna Karlsdottir, ZD2 Healthy Tips, and ZD2 Store, News from the ZD2 Area Directors, ZD2 Award Winners! ZD2 Leadership Institute, Parliamentarian, and other Tidbits, Email List of the ZD2 Board & Committee Chairmen, Dates to Put on your Calendar! Teresa Huggin’s Gift dedicated to ZD2 Members. 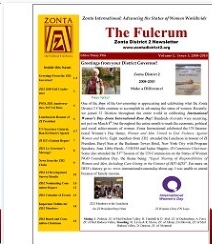 Greetings From the ZD2 Governor!, ZD2 2009 Fall Conference, IWD, ZD2 Anniversaries, $15 Vol Dues, Luncheon in Honour of ZI President, UN Secretary General, Ban Ki-Moon’s Speech, ZI D2’s Liaison Report, ZD2 Lt. Governor’s Message! 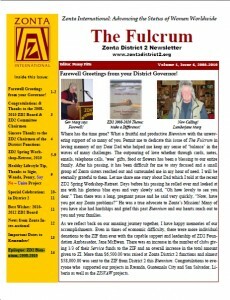 News from the ZD2 Clubs, ZD2 LI Development Survey Results, ZD2 Nominating Committee Report, ZD2 Calendar of Events, Important Tidbits for ZD2 Members, ZD2 Board and Committee Chairmen. Greetings from your Governor, ZID2 Liaison Report R. Karlsdottir, First ZD 2 Brunch, ZD2 Spring Workshop-retreat, ZD2 Fall Conference Invite, ZD2 Lt. Governor’s Message, ZD2, Parliamentarian’s , Points to Ponder, Welcome to ZI Director, Beryl McMillan, ZD2 Spring Workshop-Retreat 2010, In Memory of Jan Bowman, ZD2 Award Winners, News from the District 2 Areas, A 90th Birthday, Gift from Australia, Dates to Remember, ZIF, The New ZI Address, ZD2 Board & Committee, Chairmen. Greetings from your Governor?, ZD2 Clubs Celebrating 90 Years!, Celebrations from the ZD2 Conference, ZI & UNIFEM: SAY NO UNITE! Zonta District 2 Board, 2010 -2012, ZD2 Spring Work-shop-Retreat, ZID2 Liaison Report, Beryl McMillan, ZI Projects Come to Life! Important Dates to Remember! ZD2 Board and Committees.